It's been Fall in Toronto for a couple weeks now, but the weather has not been too bad. At least not as bad as I imagined it would be considering the disastrous summer we had that comprised of mainly clouds and low temperatures. 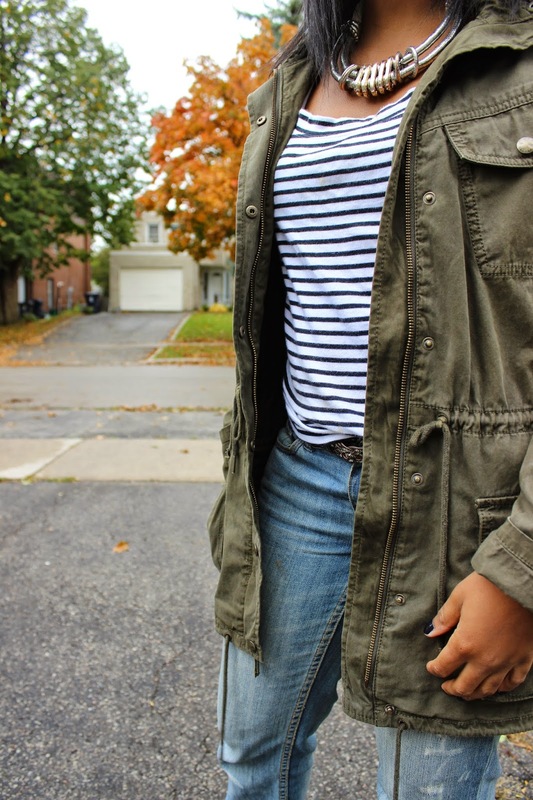 Although summer in Toronto was not the ideal summer most would have preferred, I figured at least there is Fall to look forward to, because I love dressing for Fall weather. Tights, layering, light scarfs- I love it all. For today's outfit of the day I decided to go for a more casual chic look. The nautical mid length shirt I am wearing is from Banana Republic and I placed a green utility jacket from Aritzia on top. I then placed a statement necklace from Top Shop on to help dress up the outfit. I love this necklace because it turns any simple outfit into something much more dressy and chic. The chelsea boots I am wearing are from Kate & Mel and my boyfriend jeans are from Primark. See more looks of this outfit below. Thank you for reading. I hope you enjoyed reading this post. If you did, please feel free to leave a comment below Follow my blog with Bloglovin! 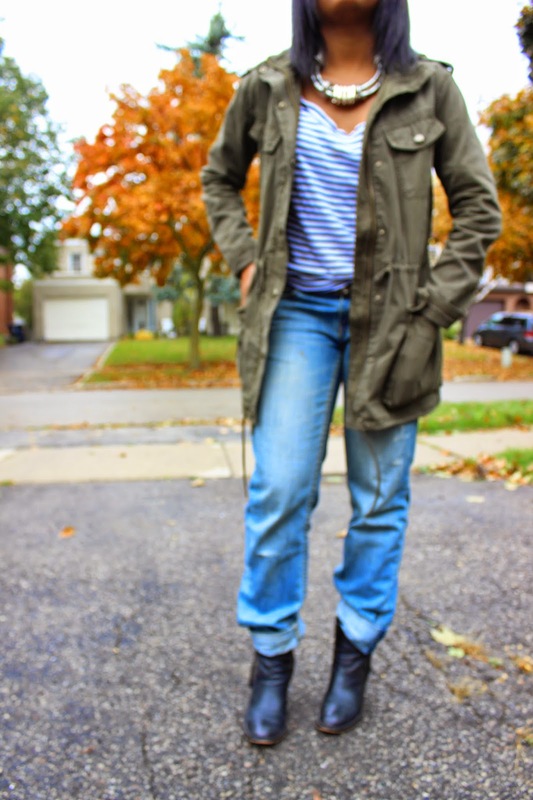 Do you enjoy dressing for Fall? Before we say goodbye to summer dresses, ripped shorts and green leaves, lets just bring out bright nail polish for one last hurrah. I know most people are searching the nail polish lines for their new Fall collections, but as a nail polish devotee and connoisseur I cannot pass up on a bubbly bright, slap in your face pink polish. Is it wrong to sometimes want to wear a pop of color on my nails that screams summer and patio drinks? I think not. I am not claiming that bright colours become extinct the moment leaves change from green to an orange-yellow shade, but rather highlighting that there is a tendency to wear deeper darker colors in the Fall. So rather than writing about the best nail polish color that will go great with your fall utility jacket, I have decided to write about a bright pink polish that I am wearing, cause occasionally I do that. The colour donned on my nails today is an Essie nail polish in the color Watermelon. Essie's Watermelon is a hot pink color that gives off a nice sheen on the nails. The color is similar to an OPI nail polish that I have called Your Such A Kabuki Queen, which is probably why I was initially attracted to the color when I picked it up. After applying a swatch of Watermelon to a piece of tape, I immediately feel for this nail polish color. I really like the vibrancy of this polish and I find that the color is so pigmented that one could get away with only applying one coat of polish, even though most people usually apply two coats to their nails. This is a great color for all skin complexions and if you a fan of bright colors you will definitely enjoy wearing Watermelon on your nails. 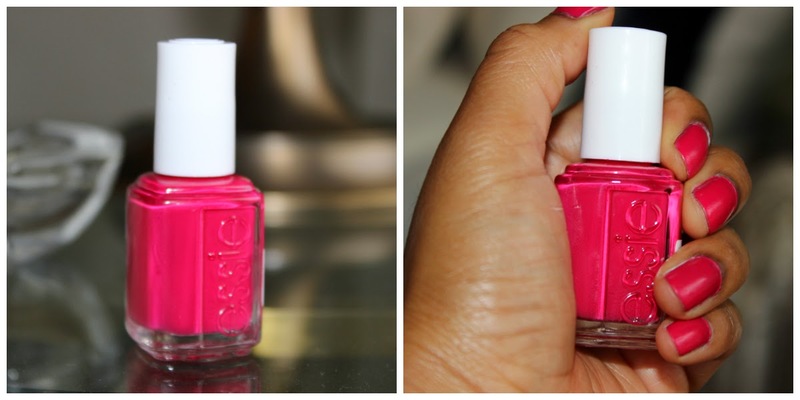 Do you think Essie's Watermelon is a color you would want to wear? It’s always nice to enjoy a delicious treat. Whether it’s Halloween or any day of the week these coated apple treats are sure to be a favorite for everyone. 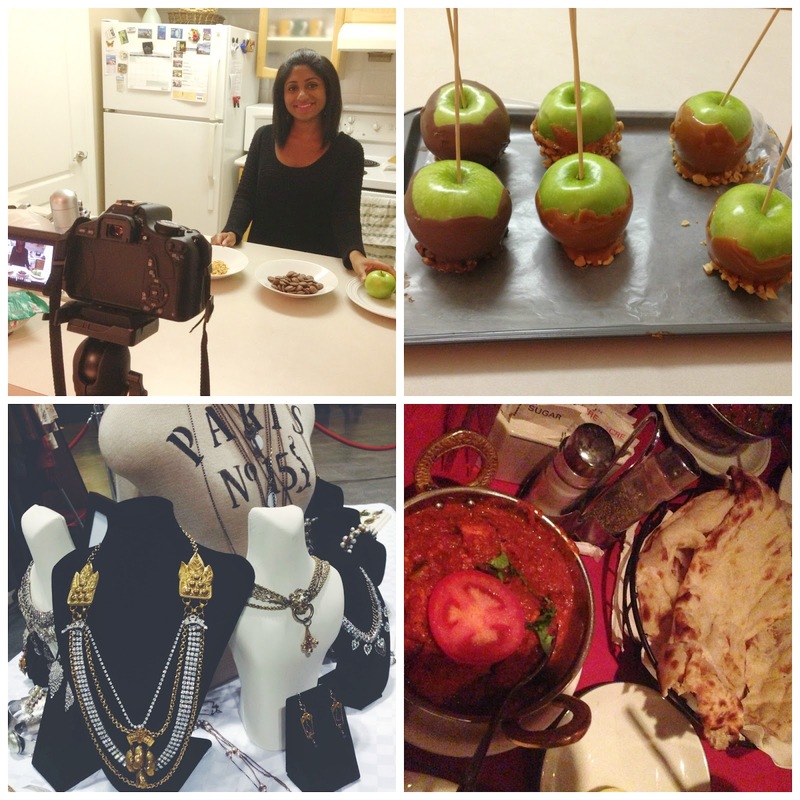 Below you will find the recipes to make caramel covered apples and chocolate covered apples. Both recipes can be made together or you can make them separately. I hope you enjoy this delicious treat. 1. Wash your apples and place them in the fridge for 20-30 minutes. This will make sure the chocolate coats the apple. 3. Take your bowl of chocolate and place it in the microwave for 50 seconds. Be sure to keep an eye as you melt your chocolate, as every microwave is different and some microwaves warm up faster than others. 4. Take out your chocolate out from the microwave. Once your chocolate is melted, begin to stir until you get a creamy consistency. 5. Take your apples and dip it into the chocolate dip. When dippining in your apple, you will want to slant your apples so that you can turn them around in the bowl to get a nice even coat. 6. Optional: After dipping the apples in chocolate, you can add peanuts to your apple. 7. Place the apples on a tray that has wax paper on it. 8. Put your apples in the fridge for 30 minutes. Feel free to leave a comment. You can also Follow my blog with Bloglovin!